CoffeeFresh Water Filters keep your Keurig or Krups water clean and odour-free, ready to deliver cup after cup of delicious, fresh-tasting coffee every time. The joy of coffee may be "all about the beans" but did you know that coffee is 98% water. CoffeeFresh filters efficiently remove chlorine, calcium and other impurities that naturally occur in tap water, and leave behind only fresh, clean and great tasting water for a perfect cup of coffee. Our filters are designed to work with Keurig or Krups Coffee Systems. 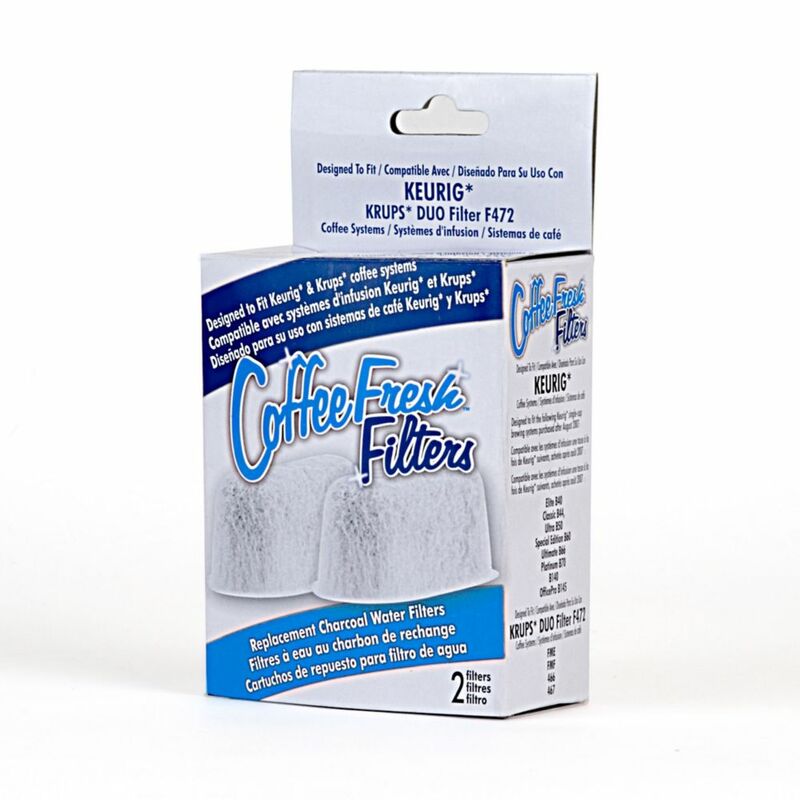 CoffeeFresh filters for Keurig or Krups are super easy to use, install within minutes with no mess or hassle. Our filters will keep your coffee tasting fresh and delicious and last up to 2 months or 60 tanks. 1 Package of CoffeeFresh for Keurig or Krups contains 2 filters. The 72-oz. capacity Cuisinart Premium Single-Serve Brewer is a fully programmable and versatile home-brewing unit that is ideal for both personal use and entertaining, making it perfect for any household. Compatible with all K-Cups<sup></sup> and equipped with the HomeBarista Reusable Filter Cup, this coffeemaker makes it easier than ever for consumers to enjoy a wide array of hot beverages. The unit has five different cup-size settings (ranging from 4 ounces to 12 ounces), and an adjustable brewing temperature to ensure desired temperatures are reached. In addition to coffee, a hot water button can be used to prepare soup, tea, hot cocoa, and more, and the unit is equipped with a rinse function for easy cleaning. CoffeeFresh Water Filters For Keurig or Krups CoffeeFresh Water Filters keep your Keurig or Krups water clean and odour-free, ready to deliver cup after cup of delicious, fresh-tasting coffee every time. The joy of coffee may be "all about the beans" but did you know that coffee is 98% water. CoffeeFresh filters efficiently remove chlorine, calcium and other impurities that naturally occur in tap water, and leave behind only fresh, clean and great tasting water for a perfect cup of coffee. Our filters are designed to work with Keurig or Krups Coffee Systems. CoffeeFresh filters for Keurig or Krups are super easy to use, install within minutes with no mess or hassle. Our filters will keep your coffee tasting fresh and delicious and last up to 2 months or 60 tanks. 1 Package of CoffeeFresh for Keurig or Krups contains 2 filters.